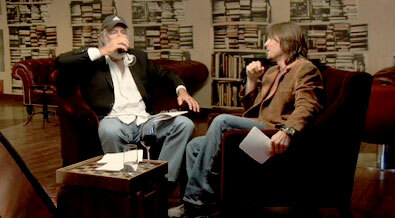 Creativity has a new video series featuring a “conversation” between creative heavyweights Lee Clow and Alex Bogusky. In the first clip, they talked about agency dress codes, and Clow managed to slip in the phrases “pushing the envelope” and “the inmates are running the asylum.” In the second clip, which is out now, they discuss the word “advertising” and the challenge of innovation. Clow credits Apple Computer for encouraging TBWA to become a “total media-arts company.” Bogusky says he has no good prediction more than 30 minutes into the future for how advertising will evolve. There’s no visible halo of light surrounding Clow in the videos, but he does seem to be taking advantage of the free wine more so than Bogusky.